Breaking news: The winner of Fatal Reservations is Beth Kanell! LUCY BURDETTE: with Fatal Reservations launching in less than two weeks, it’s hard to think about anything else. Never mind write about anything else! So if you'll indulge me, I'm going to talk about one of my favorite characters in the Key West series. In Fatal Reservations, my recurring character, Lorenzo the tarot card reader, is accused of murder when one of the other street performers from the Mallory Square sunset celebration is found dead. After leaving the bar, I drove my scooter the length of Whitehead Street toward Mallory Square to see if Lorenzo was working. Every night at sunset, except in the very worst weather, street performers marked off sections of the pier and set up shop to entertain tourists and part them from a few of their dollars. Along with the zaniness of Duval Street, the spectacle of the sun setting over Mallory Square tended to stick in the minds of visitors more than anything about Key West. Lorenzo has been working the square for almost twenty years, wearing a star-studded turban, a deep blue cloak with a matching blue stone glued to his forehead, and a mustache waxed into loops. Sounded hokey, but even I felt more confident having my cards read by a guy who took the time to look and act professional. DEATH IN FOUR COURSES: Hayley's mother, Janet, was the person who got her hooked on having her cards read. Here Hayley has taken her mom to meet Lorenzo. Lorenzo turned over my three cards: the devil, the tower, reversed, and the emperor. But I’d seen how happy she looked when Lorenzo turned over the two of cups and explained that true love lay in her future. She believed completely in this stuff. Two new customers, middle-aged women wearing tropical sundresses and heavy tans, approached Lorenzo’s table and peered over my shoulder. “Oh my gosh, she’s got the tower,” said one to the other, and then they backed away. It made no sense to let myself react so strongly to a couple of colored cardboard cards, but the last time Lorenzo had turned up the tower, I’d nearly been killed by a crazy woman. 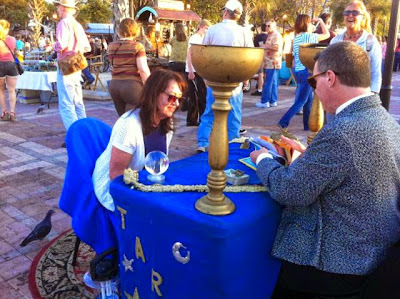 Anxious to get a tarot card reading from Lorenzo, I pushed through throngs of tourists enjoying the Mallory Square party. The last few days had left me feeling sad and unsettled--I hoped he could shed some positive light on the future. In the distance, the Disney Magic cruise ship had swung around and started to chug through the channel, on to its next stop in the cycle of manufactured fun. Lorenzo had set up his table about ten yards from the water, looking distinguished in sunglasses and a jacket shot through with gold threads. Three middle-aged women were stacked up only feet from his table, fidgeting and trying not to stare at his current customer as they waited for their readings. Ten minutes later, Lorenzo took the seat beside me, carrying a cup of tea and a slice of pie. His dark hair curled like mine in the humidity, and he wore Harry Potter–style round glasses and red clogs. I felt instantly calmer in his presence. “I was hoping you weren’t on a diet,” I said, pointing at his plate. “The cards say, ‘Never pass up key lime pie,’” he told me as he swallowed the first creamy bite. And finally, comes FATAL RESERVATIONS. In this book, Lorenzo is at the center of the mystery, when he's accused of murdering one of the other street performers. In real life, of course, no such thing has gone on. I can only say he's been such a good sport! Lorenzo nodded, adjusted his collar, and came forward. By dress alone, he stood out from most everyone in attendance: long-sleeved white dress shirt, high-waisted black pants, black tie, tortoiseshell glasses—even his wavy hair had been smoothed into a neat ponytail. All very proper and distinguished. But his face shone in the spotlight and large damp circles spread from his underarms to the body of his shirt. He looked very hot. And rattled. Ah, Lorenzo is one of my favorite characters. Thanks for these wonderful reminders of the part he's played in each of the stories. I can hardly wait to find out how Lorenzo got tangled up in a murder . . . .
My family is visiting Key West this week, so this has a special attraction for me. Wow I love the Tarot Card Readings. Sounds quite exciting. Please enter me. Jane, I hope you get a chance to meet him down at Mallory Square! Just got started with the series and can't wait to get caught up!
" 'The cards say, ‘Never pass up key lime pie,’ " he told me as he swallowed the first creamy bite. — words to live by! Can't wait to read! Cool, sounds like great cozy mystery. I love that Lorenzo has had a style revolution! When even the minor characters grow through a series, you know the author is not just coasting along from book to book, but working hard to make each book the best book possible. Love Lorenzo--and the cards! My tarot deck is now lovingly in the hands of the next generation. I heart Lorenzo. I heart Hayley Snow! I loved Death With All The Trimmings and can't wait to get my hands on Fatal Reservations! He does indeed sound like a good sport! I'm looking forward to Fatal Reservations! Lorenzo is adorable, both in real life and in his fictional recreation. Thanks for sharing him with us, in your Hayley Snow books, and on the blog. 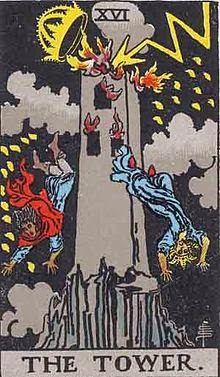 I really want to learn more about tarot. We have a Halloween party every couple of years (it's a big deal, so every year would be enough to put me out of commission, I fear), and the next one is going to have either a palm reader or a tarot card reader. In the meantime, looking forward to Fatal Reservations! I SO love this series! It's smart and classy and funny and a great mystery every time. And I love that you can read them in any order, and that they are so--well, they're smart. What a terrific main character--I love Hayley! ANd the WINNER of the ARC of WHAT YOU SEE is SUSAN who chose High Society on Tuesday's blog. Susan, email me h ryan at whdh dot com with you are address! And now back to FATAL RESERVATIONS! I would love to read this series, starting with the new one (which I will hopefully win) - no better recommendation than from HPR!! I love Lorenzo - he's such a fabulous continuing character! I cannot wait to read FATAL RESERVATIONS. Lorenzo sounds like a great character. And I'm with him on the key lime pie. Congrats on the new book! Definitely yes on Key Lime Pie. One of my kids friends (who we assimilated into the family)is a C.I.A. Graduate Baker. He always brings a Key Lime Pie when he comes for holiday meals. I love the series and I always enjoyed reading about Lorenzo. I own the five previous books and would love to add this one to my home library. Great feature on Lorenzo! Thanks for sharing with us! Lucy, that was fabulous! Lorenzo is one of my favorite characters (in one of my favorite series!) and such fun not only to see him evolve in the books, but to see the real Lorenzo! These tid-bits give me a great glimpse of Lorenzo, and now I know I need to go read all the books & get to know him! I really enjoy your books! I love being transported back to every KW street, site and restaurant that you mention in your stories. Looking forward to this one! Already have my copy and will probably start it next week while I'm in Georgia for work. What a fun post! I need to get up to speed on your series. What a fab look at the real and fictional Lorenzo, Lucy! 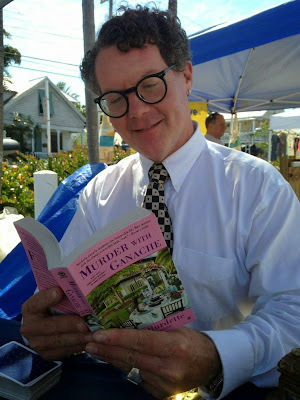 You two should do a book-signing/card-reading event the next time you're in the area - which I think will be at the Mystery Writers Key West Festival in August, right? I am just as excited as you are to find out why poor Lorenzo is being accused of harming anyonr. Julia, I will not make the Key West mystery fest this year:(. But LOVE the idea of a booksigning/card reading party! Marvelous evolution of fiction and fact. Love it! Did Tonka get a reading, too? Sorry to hear the yokels made him feed he had to change his style, but he looks good (albeit different!) both ways. I need to go back and check about that reversed tower. Isn't that supposed to reverse the meaning of the card? Basically, unless you're Roma, don't do it. As you know, Lucy, Key West is my favorite vacation spot, and reading your books allows me to stroll down the streets and take in all the ambiance that make this place so special. I have loved Lorenzo from the first book, as he represents so much of what makes Key West unique. Not that other places don't have Taro readers, but sitting on the boardwalk beside the ocean while having one's cards read is such a treat. 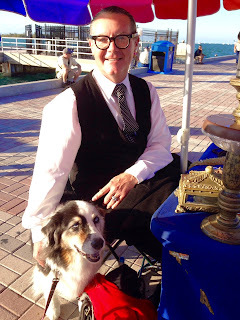 In my first trip back to Key West in seven years last fall, I made sure to include a reading by Lorenzo. He's very professional/serious about what he does, but he's also a very nice. I, of course, had to mention my connection to you. I have started reading Fatal Reservations, and I can't wait to see what happens with Lorenzo! I started it late Tuesday night and didn't get to read yesterday because of being out of town overnight. I'm champing at the bit to get back get back to it this afternoon! Goodie. Another book for the TBR pile! If I ever make it to Key West I will have to meet Lorenzo. I've never had a tarot card reading. But I have eaten Key lime pie. Lots of times. Loved all these books, look forward to the next! I'm reading Death with all the Trimmings right now. I'm sure I will love this series as I love the author's writing in another series under another name. I am excited too. I cannot wait to read this book. Lorenzo sounds like quite the character and fits into your stories so well that without the pictures, I would have thought you made him up. The book sounds like a trip to the light fantastic and I can't wait. Lorenzo says I have a chance to win an eBook copy.